These are the best sediments for aquariums. Quartz sand comes from crushed siliceous rocks (granite). Its grains, 1-3 mm long, have sharp splinters that can irritate burrowing fish, but it enables the water to circulate well. Its color varies according to its iron oxide content. Quartz sand is considered a sediment low in nutrients, and it is better suited to filtration. There are various types of sand, with different sized particles and colors. Loire sand, as its name suggests, originally came from the bed of the river Loire in France. These days, identical sand is taken from other rivers or pits. 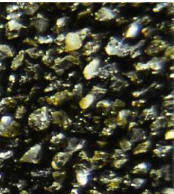 The grains are more eroded, and therefore finer (0.5-1 mm), than those of quartz sand. When it has been taken from rivers, it contains residues of nutritive material that can be absorbed by plants. Dark sediment can be used to set off pale fish. This pale-colored sand appeals to many hobbyists, but it has the disadvantage of not allowing the water to circulate freely. Moreover, unsightly deposits of plant debris, excreta, and leftover food show up very clearly, and, finally, the finest grains of sand may finish up suspended in the water. However, bottom-dwelling fish endowed with barbels seem to appreciate this type of sand. 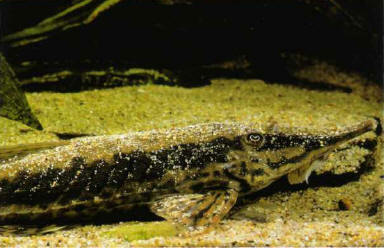 Some fish (here, Sturisoma rostratum, from South America) use fine sand to hide themselves, either wholly or partially. Some aquarists may be tempted to collect sediment themselves from a natural setting, although in theory this is forbidden. A clean and well-oxygenated watercourse must be chosen. 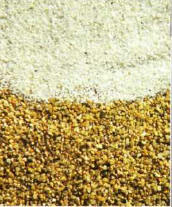 The granule size gradually decreases as the water flows downstream. Sediment can often be found where it has collected in the inner part of a bend in a watercourse. КАПИТОЛИЙСКАЯ ТРИАДА , в Др. Риме три важнейших бога (Юпитер, Юнона и Минерва), почитавшихся в Капитолийском храме.